It’s been a week now since a madman launched a deadly attack in Las Vegas that killed and wounded hundreds of people. Several Ohio residents were in the crowd, including a man from Columbus who desperately tried to aid riddled victims. The pictures and videos that have emerged from that night are difficult to watch and even more difficult to understand –- and compounded by the fact that we may never know the motive behind this attack. Here’s what we know is true: every time a shooting like this happens, the radical gun control crowd from Columbus to D.C. uses the blood of the innocent victims to try to guilt gun owners into submission. They are counting on you and me cowering in the corner, and giving them a chance to pass gun control — as though somehow we are responsible for this heinous action. As you may have heard, the NRA has already conceded the fight and announced that they are willing to allow the ‘bump stocks’ that were presumably used in this case to be heavily regulated. Congressmen and Senators alike, both Republicans and Democrats, are banding together to call for more gun control. Most are licking their lips, hoping that this “small gun control bill” is the start of something much bigger. Here in Ohio, anti-gun legislators are joining with our weak-kneed governor in the hopes that an anti-gun crackdown could make it through the Statehouse, and bury our chances at passing pro-gun bills like Stand-Your-Ground and Constitutional Carry. Many of you have contacted us, asking what gun owners in Ohio should do regarding this ‘bump stock’ issue at the federal or state level. Here’s our reply to our members, the media, and anyone else: law abiding gun owners had nothing to do with the events that took place in Las Vegas last week and we are not going to surrender any of our rights due to a media- hyped guilt trip! And make no mistake, this has nothing to do with ‘bump stocks,’ and whether you love or hate ‘bump stocks’ is irrelevant. This is an obvious attempt by the gun control crowd to try to guilt Congressional leadership into putting a gun control bill on the floor of Congress. From there it can go anywhere, via amendments. Don’t take our word for it, Google it! Even if ‘all’ they do is ban ‘bump stocks,’ it sends a message that gun owners are the responsible ones and our rights have to be diminished because of the actions of a madman, meaning they attack a little more each time! 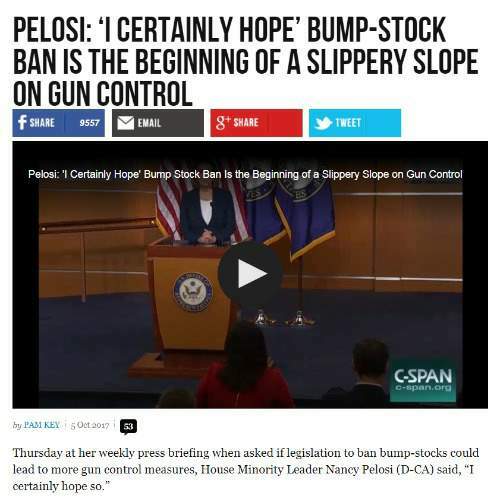 Of course, the feckless Rep. Paul Ryan (Speaker of the House) has already caved too, indicating his support of regulating these ‘bump stocks’ and opening the door on more gun control. I don’t know about you, but I’m sick and tired of being told that I’m somehow guilty because someone else used a gun to commit murder! What happened in Las Vegas had nothing to do with guns, and everything to do with pure evil in the heart of the man or people who pulled the trigger. Your message to all of them is very simple: Hold the line and oppose any new gun control, no matter who authors it or what the NRA says about it. Period! And when you’re done, please consider joining or renewing your support in Ohio Gun Owners. No organization fights harder for your gun rights in Columbus for your gun rights than we do. No organization instills fear in the hearts of gun-grabbers in the Capitol like we do. And no organization will push harder to continue to expand our gun rights next session than we will! But we can’t do it alone, so please join the other Ohioans who are a part of Ohio’s largest and only ‘No Compromise’ gun rights group today! Whatever you do, make sure you contact both of your Senators and your Congressman right away, that’s most important. P.S. Watching the NRA, Speaker Paul Ryan, and countless other weak-kneed ‘pro-gun allies’ cave in to the demands of the anti-gun crowd over the last week has just about made me sick. I don’t know about you, but I’m sick and tired of my rights being threatened every time some madman with a gun opens fire! So with gun control legislation being drafted, please contact Ohio’s congressional leaders immediately and insist that they vote “NO” on any gun control. And, when you’re done, please join Ohio Gun Owners right away. No one fights harder in Columbus for the Second Amendment. We don’t back down. We don’t apologize. And we don’t give in. Please join right away!